(Previous Exhibit) The N.C. Museum of History will host an original First Folio of Shakespeare from Saturday, May 7, through Monday, May 30, as part of a national touring exhibition celebrating 400 years of Shakespeare. The N.C. Museum of History in Raleigh will host an original 1623 Shakespeare First Folio. Considered one of the most influential books in the world, the First Folio includes 36 of Shakespeare’s plays, 18 of which had never been printed before. Without the First Folio, all of those plays — including “Macbeth,” “Julius Caesar,” “Twelfth Night,” “The Tempest,” “As You Like It” — might have been lost forever. Compiled by two of his friends and fellow theater colleagues, the First Folio was published seven years after Shakespeare’s death in 1616. Folger Shakespeare Library, which holds 82 copies of the First Folio and is the world’s largest Shakespeare collection, is touring a Shakespeare First Folio to all 50 states, Washington, D.C., Puerto Rico and the U.S. Virgin Islands in 2016 to commemorate the 400th anniversary of Shakespeare’s death. The N.C. Museum of History is the only stop on the tour in North Carolina. 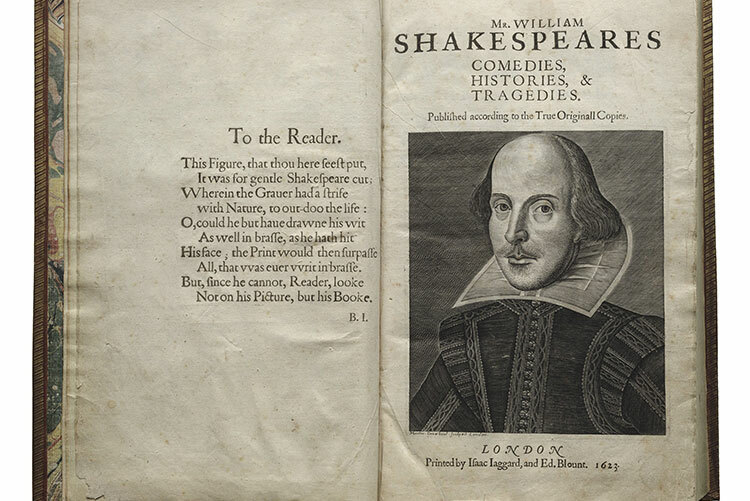 The 1623 book will be on view in the exhibit First Folio! The Book that Gave Us Shakespeare from Saturday, May 7, through Monday, May 30, at the N.C. Museum of History. It will be opened to the most quoted line from Shakespeare, “to be or not to be” from “Hamlet.” Accompanying the 1623 book will be a six colorful panels exploring Shakespeare’s impact, then and now. Admission is free. To find out more about the exhibit, visit www.wonderofwill.folger.edu. The First Folio! national tour is part of the Folger Shakespeare Library’s 2016 Wonder of Will celebration of 400 years of Shakespeare. The exhibit is produced in association with the American Library Association and Cincinnati Museum Center. First Folio! The Book That Gave Us Shakespeare, on tour from the Folger Shakespeare Library, has been made possible in part by a major grant from the National Endowment for the Humanities: Exploring the Human Endeavor, and by the support of Google.org, Vinton and Sigrid Cerf, the British Council and other generous donors.